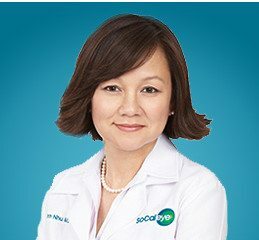 Trinh Nhu, M.D., F.A.C.S, joined SoCal Eye in 1997, with the opening of their second office in Los Alamitos. Dr. Nhu is a Diplomate of the American Board of Ophthalmology, a Fellow of the American Academy of Ophthalmology, a fellow of the American College of Surgeons, and a member of Alpha Omega Alpha Honor Medical Society. Dr. Trinh Nhu is also a professor of ophthalmology at the University of California Irvine School of Medicine. As a board-certified ophthalmologist for over seventeen years, Dr. Trinh Nhu has extensive experience treating all eye diseases. In addition to performing cataract surgery with the latest accommodating, multifocal, and toric intraocular lenses, she also performs clear lensectomy, glaucoma, pterygium, eyelid cancer removal and reconstruction, as well as blepharoplasty. Most important of all, Dr. Trinh Nhu is committed to providing her patients with exceptional eye care. Posterior Chamber Secondary IOL – Advantages & Morbidity. Applications of PAR Corneal Topography to PRK. Effect of Misalignment of the 193nm Excimer Laser and its Implication on Human Corneal Surgery. PRK clinical studies. A Survey of Ophthalmic Screening for Diabetics by Primary Care Physicians. Application of the KTP and Excimer Laser in Performing Endarterectomies; Presented at the annual American Heart Association student researcher meeting.